The workshop, “Stakes are High: The Impact of Midterm Elections,” ran from noon to 1 p.m. in multipurpose room F5-201. ELAC Political Science Professors Dr. Kenneth Chaiprasert and Rogelio Garcia took the stage as the featured speakers and the event stressed the power of democracy. A PowerPoint presentation accompanied the duo and showcased the demographics of past voter participation and previous election turn out. 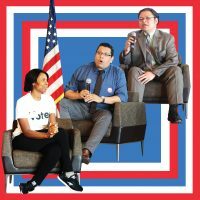 Highlights from the event included the pair emphasizing the importance of voting and how necessary it was to turn in ballots for the midterm election and not just the presidential election. The significance of this midterm election is rooted in the belief that the House of Representatives may flip from Republican to Democrat control. This is based on the increased voter registration from the youth population. “We’ve had record breaking registration this election period from the younger generation and we’re hoping this gets reflected in the voter turnout,” Chaiprasert said. Historically, according to the U.S. Election Project, the youngest voting bracket, ages 18 to 29, have the lowest voter turnout. In addition, the Hispanic demographic is also the lowest. “We need to go out and vote. We need to elect more diversity. More young people, more women, more people of color,” Garcia said. Attention to the 2008 and 2012 presidential election voter turnout was raised by Chaiprasert, who noted that it was the only two times in history that the white demographic was surpassed in turnout. “This is proof that we can do it. We must mobilize together to get what we want. It can happen, and it will happen,” Chaiprasert said. The issue of California passing Proposition 187 in 1994, “Save our state S.O.S.,” was brought up by Chaiprasert as a scenario of what could happen if people didn’t exercise their right to vote. Prop 187 was controversial because it tried to deny public services like access to health and education to unauthorized immigrants in the state. It was ultimately ruled unconstitutional however by the federal courts as a violation of due process. Another topic touched on was the controversial U.S. and Mexico border wall, and what the midterm election could do to affect it. The idea that Prop 187 had been passed to an overwhelming majority vote as recently as 1994 and the current issue of the border wall was emphasized during the event. The two pushed the importance of the younger generation exercising their right to vote. The two closed the event by fielding questions from the audience and urging students to pre-register to vote in the next election.